Sunday, October 27th - Marks the Kathina Ceremony, which is a robe offering ceremony, presented to monks who have completed their 3 months rains retreat period. In addition, on October 20th, we had meditation members ordain for Kathina Ordination. 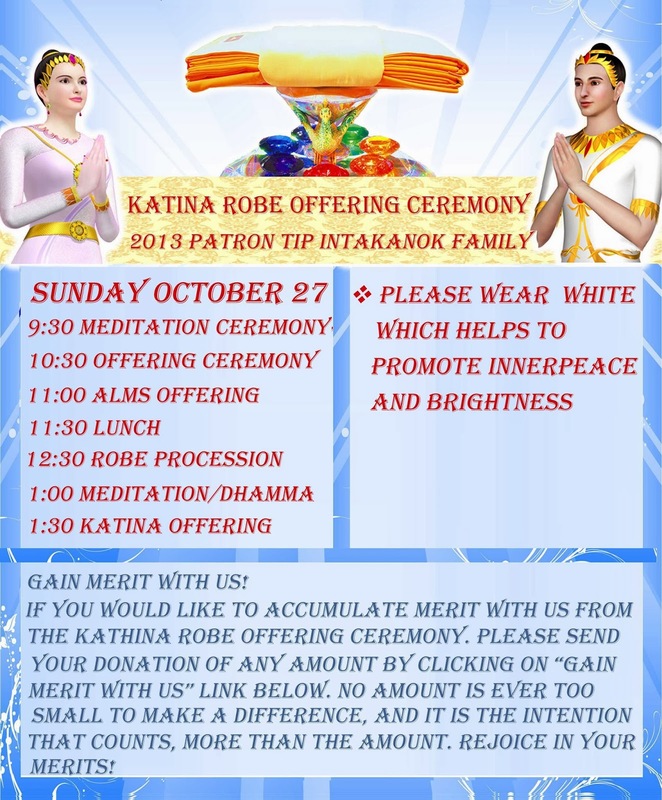 Kathina ordination is a 7 day period and ends on October 27th, with the commencement of the Kathina Ceremony. It is an excellent opportunity for our members to be a part of the Sangha during such a meritorious celebration. Schedule for Sunday October 27th below. Katina refers to the offering of the special robe (Katina civara) prepared and presented to monks who have completed the three-month period of retreat called Vas in Sinhala, and Vassana in Pali, meaning the period of rain. Katina literally means ‘firm,’ or ‘solid,’ because the offering of a Katina robe helps to earn solid good karma. The Katina Ceremony is over 2500 years old. It is a monastic tradition preserved and observed by Buddhists all over the world because it is an extraordinary opportunity to acquire merit once a year. At the close of the Vas retreat, the monks perform the pavarana ceremony. During this ceremony, the monks get together and invite one another to point out their faults and lapses. It is friendly and constructive criticism and almost invariably well received. The practice is intended to help the monks purify themselves. The Katina robe is significant because during the three-month Vas period, Buddhist monks are required to remain fully dedicated to purifying themselves through the rigorous practice of meditation and moral conduct. As the monks end the retreat and come back to society, they become deservedly worthy of offering and veneration as ‘punnakkhetta’ or ‘field of merit’ to the fullest extent possible. A robe offered to such a monk potent with spirituality and dedication to religious living at this time, helps one to earn solid merit or good karma. One of the stanzas chanted during Katina glorifies the greatness of the merit which one gets from performing Katina. It says that even this solid earth, or a solid rock or a piece of diamond could tremble, shake and break at times. However, the merit obtained by offering of Katina cannot be nullified by anything until one achieves the ultimate goal of Buddhist aspiration which is Nirvana. We would like to invite our meditation members to come and witness this wonderful ceremony with us filled with an abundance of merit gaining experiences, held this year on October 27, 2013. Feel free to come at any time that is convenient for you, but it is recommend to come before the alms offering portion of the day, which is where lay people offer food to the monks and there is always plenty of food prepared by many to offer to the Venerables, so please join us! *Please wear white which helps to promote inner peace and brightness.